Particularly vulnerable trees are planted close to parking lots, near street curbs, driveways or in lawn areas. Trees on construction sites are also at risk. The bark on trunks is the part of trees most often subjected to mechanical damage, especially in spring and early summer when the cambium is active and the bark “slipping.” A slight blow at that time can cause the bark to loosen or tear off. The primary effect is reduced translocation of water, minerals and sugars due to the loss of bark and sapwood. Long-term effects are potential development of decay. If more than 50% of the circumference of the tree has been destroyed, consider removal. Common causes of mechanical injury are landscape maintenance equipment, staking damage, vehicles, vandalism or weather. Trees in lawn areas are often partially girdled by lawn mowers and string trimmers. On young trees in turf the grass often returns upright after being cut and hides the damage to the bark. 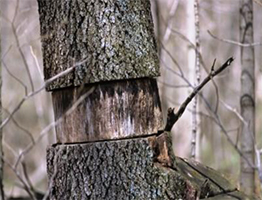 Vandalism of trees includes damaged tops, bark cut, beaten or torn from the trunk or girdling by saws or axes. 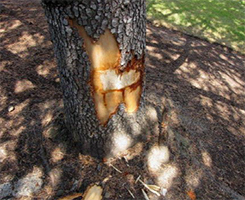 Improper staking or guying can result in damaged bark or wood. Young trees increase in girth quickly and unless the ties are inspected regularly they can girdle the trunks. A guard on the trimmer or a protective sleeve around the trunk will prevent such injury. The best solution is to create a turf-free area around the trunks of your trees. This will reduce the likelihood of lawn mower and string-trimmer injury but it will also increase the rate of tree growth. Bark injuries can often be repaired by bark implants if it is done soon after it has been loosened. Follow up on new plantings to remove stakes and wires within one year. 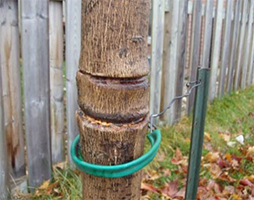 Trees subject to bark injury should be protected by 2 or 3 guard stakes.